Eye : Corneal ulcer, bacterial Conjunctivitis. Ear : Otitis externa, acute otitis media, chronic suppurative otitis media. Eye : The recommended dosage regimen for the treatment of corneal ulcers is two drops into the affected eye every 15 minutes for the first 6 hours and then two drops into the affected eye every 30 minutes for the remainder of the first day. On the second day, instill 2 drops in the affected eye hourly. On the third to fourteenth day, place two drops in the affected eye every four hours. Treatment may be continued after 14 days if corneal re-epithelization has not been occurred. Ear : For all infections, 2 - 3 drops every 2 - 3 hours initially. 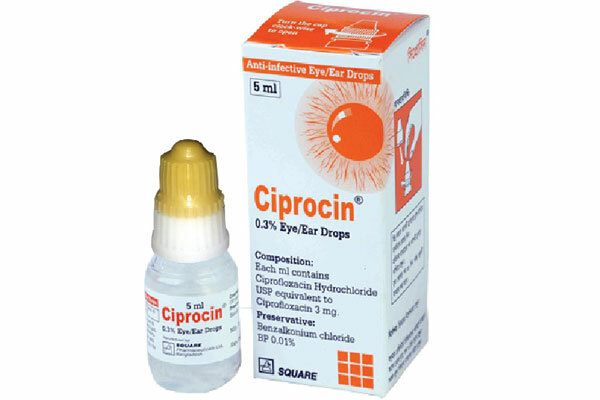 Ciprocin™ Eye Drops : As a sterile ophthalmic solution 5 ml in plastic dropper bottle.